As we discussed in Chapter 6, flowing water is a very important mechanism for both erosion and deposition. Water flow in a stream is primarily related to the stream’s gradient, but it is also controlled by the geometry of the stream channel. As shown in Figure 13.14, water flow velocity is decreased by friction along the stream bed, so it is slowest at the bottom and edges and fastest near the surface and in the middle. In fact, the velocity just below the surface is typically a little higher than right at the surface because of friction between the water and the air. On a curved section of a stream, flow is fastest on the outside and slowest on the inside. 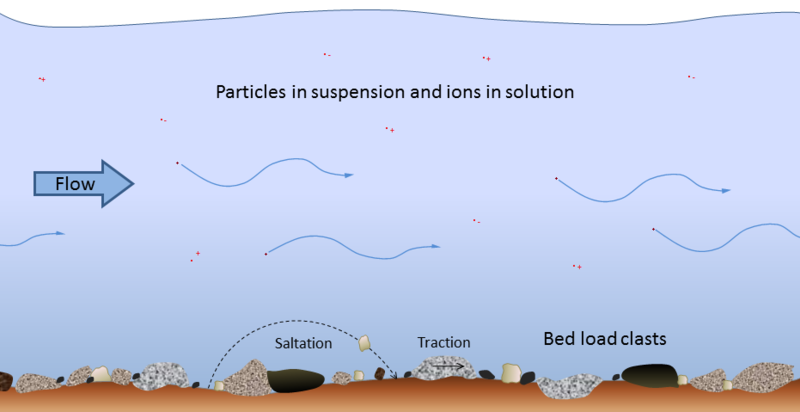 Figure 13.15 shows the nature of sediment transportation in a stream. 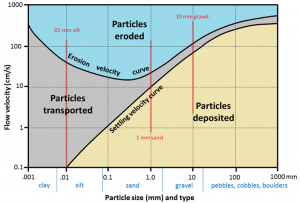 Large particles rest on the bottom — bedload — and may only be moved during rapid flows under flood conditions. They can be moved by saltation (bouncing) and by traction (being pushed along by the force of the flow). The faster the water is flowing, the larger the particles that can be kept in suspension and transported within the flowing water. 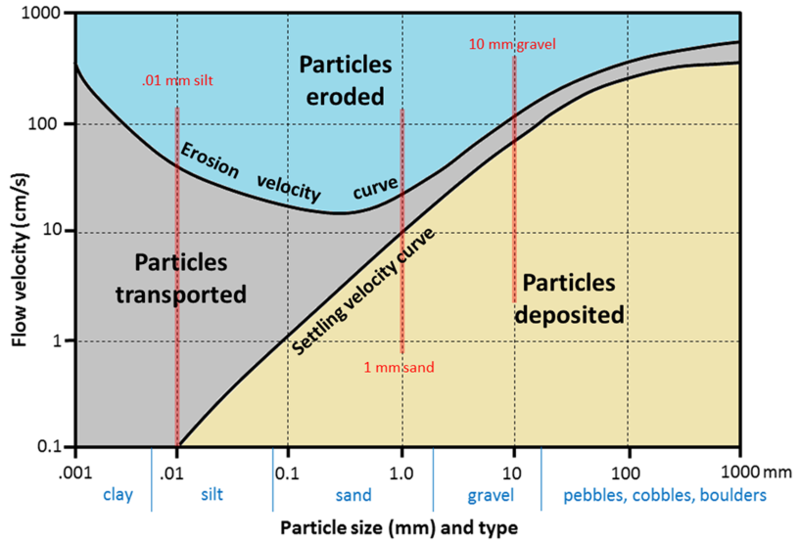 However, as Swedish geographer Filip Hjulström discovered in the 1940s, the relationship between grain size and the likelihood of a grain being eroded, transported, or deposited is not as simple as one might imagine (Figure 13.16). Consider, for example, a 1 mm grain of sand. If it is resting on the bottom, it will remain there until the velocity is high enough to erode it, around 20 cm/s. But once it is in suspension, that same 1 mm particle will remain in suspension as long as the velocity doesn’t drop below 10 cm/s. For a 10 mm gravel grain, the velocity is 105 cm/s to be eroded from the bed but only 80 cm/s to remain in suspension. Refer to the Hjulström-Sundborg diagram (Figure 13.16) to answer these questions. A stream typically reaches its greatest velocity when it is close to flooding over its banks. This is known as the bank-full stage, as shown in Figure 13.17. As soon as the flooding stream overtops its banks and occupies the wide area of its flood plain, the water has a much larger area to flow through and the velocity drops significantly. 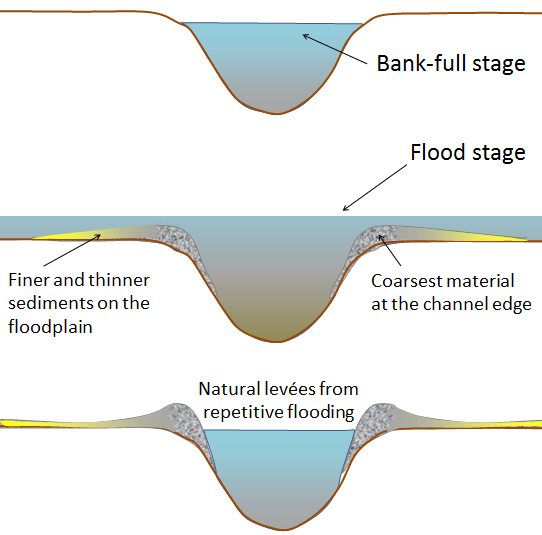 At this point, sediment that was being carried by the high-velocity water is deposited near the edge of the channel, forming a natural bank or levée. 13.3 Stream Erosion and Deposition by Steven Earle is licensed under a Creative Commons Attribution 4.0 International License, except where otherwise noted.